shed for any information. Friendly people had to live in unrest. history of the Sacred Realm and the Triforce. accounts here do reference the Hylian people as part of history. Triforce which can only be a derivative of the original Creation myth. place in the Sacred Realm, where it was placed by the goddesses. those not interested in reading eight pages on the subject. The second class of theorists opts to say that Ocarina of Time has been disconnected from the Imprisoning War narrative, which has been reestablished as a part of A Link to the Past‘s independent story. beyond, this article will deal with the first view. we know that it lasted until at most ten years prior to the start of Ocarina of Time. 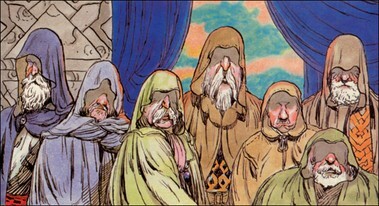 one kingdom prior to the Sleeping Zelda story. Ocarina‘s depiction of the pre-wars, however, fails to describe the cause and nature of these wars, so the parallel with A Link to the Past is imperfect. Thus, we must look to another source for confirmation of this connection. a squabble over the Triforce and the Sacred Realm. Twilight Princess, then, can still be seen, despite translation errors, as providing context for an event that originated prior to Ocarina of Time that further cements its position as the Imprisoning War of A Link to the Past‘s backstory. seen a Sheikah around here for a long time. They say that Princess Zelda’s nanny is actually one of the Sheikah, who many thought had died out. belonged to the tribe that protected the Hylian royal family long ago. that they are one and the same. While the Shadow Clan that attacked Hyrule is never specifically addressed in either A Link to the Past or Ocarina of Time, their addition does nothing to harm the connections between these games’ battles and those referenced in Twilight Princess. dark tribe sought to take the Triforce. shadow realm inside which the Shadow Clan was sealed. These elements are eerily evocative of another dark mirror in Hyrulean history: the Dark Mirror referenced in Four Swords Adventures. The Dark Mirror is said to have the power to bring the wickedness in people’s hearts to life, which we see in action in Twilight Princess as already described. It also spawns evil creatures—in Adventures we encounter the Shadow Links and Armogohma from Twilight is heavily implied to have been created by the magic of the mirror. hidden in the forest temple to sever its connection to this world. Twilight Princess took this concept of a mirror-bound tribe and expanded its lore considerably. 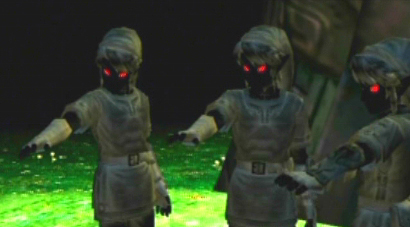 in Twilight Princess was only used to execute people at the Arbiter’s Grounds after the Child ending of Ocarina of Time. was used for a “certain big criminal,” that criminal being Ganondorf. condemned. This explains why, in Twilight Princess, it is no longer kept at the temple where it can be found in Four Swords Adventures. subsequently sealed. The conflict ended within a decade of Ocarina of Time with the King of Hyrule unifying the kingdom. the Mirror remains in the same temple where it was originally sealed. establish dominion over the holy land of Hyrule. A great battle ensued. and hidden in the temple to sever its connection to this world. that of the entire world, took the child in and raised him as a Kokiri. The boy’s name was Link. The conflicts ended when the King of Hyrule unified the kingdom. I hope you enjoyed the article and I hope I have offered a greater understanding of the background conflicts of the Zelda series that are unrelated to Ganon. Please tune in soon for the follow up article about the Ancient Sages!